The Ultimate Bitfinex Review - Should You Use It? Bitfinex is a premier destination for seasoned traders all over the world and one of the top exchanges in terms of recognition and trading volume. Operating since 2012, it serves all except few countries in the world (mentioned below) and supports both fiat-to-crypto and crypto-to-crypto trades. Other notable features include margin trading, limit and stop orders, over the counter (OTC) trades, and others. While there are many options available, everything is laid out in an impressively intuitive fashion, with easy to navigate dashboards and menus. Yet despite the robust day-to-day security measures, Bitfinex has been hacked twice (in 2015 and 2016). Since then it has significantly improved its security and compensated lost funds to every user. Exchange Trading. Central limit order books where users can deposit, trade, and withdraw digital tokens. Margin Trading. Qualified users can trade with up to 3.3x leverage by receiving funding the margin funding platform. Margin Funding. The P2P financing market which allows users to earn interest by lending funds to other users who trade with leverage. OTC Desk. Bitfinex allows traders to deal directly with each other without having to go through public order books. High Liquidity. Bitfinex is one of the top exchanges in terms of BTC/USD daily trading volume, which guarantees price stability and confidence for every trader. Trading pairs. The platform offers over 100 market pairs, including both leading coins such as Bitcoin, Ethereum, Ripple, and EOS, and popular altcoins like TRON, Stellar, NEO, 0x, QTUM, and many others. Comprehensive trading options. Besides margin trading and funding, traders can take advantage of limit, market, stop, trailing stop, fill or kill, iceberg, OCO, hidden, and post-only limit orders. Security. 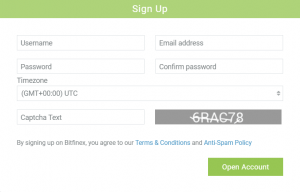 Due to a few hacks in the past, Bitfinex takes extra precautions to secure its platform. These include storing 99.5% of user funds in cold storage, DDoS protection, database encryption, and regular backups. User accounts can whitelist withdrawal addresses and IP’s, set up 2FA and U2F, suspicious activity analysis, session hijacking prevention, and more. As a trading platform for cryptocurrencies, Bitfinex charges trading fees. These vary according to the amount being traded, and according to whether the user is the “maker” or “taker” of a trade (i.e., according to whether they trade by making a new order, or by taking an existing order). The maker fees range from 0.1% to 0.0% while the taker fees vary from 0.2% to 0.055% based on the executed trade volume in the last 30 days. To put this in some perspective, Poloniex – which also charges “maker” and “taker” fees – imposes a 0.25% taker and a 0.15% maker fee for any trades less than 600 BTC. 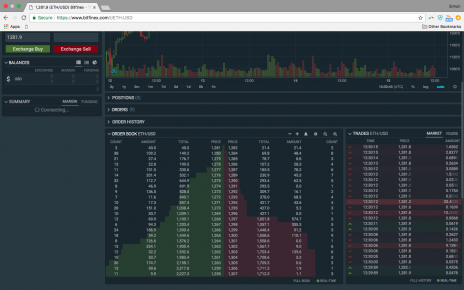 This makes Bitfinex one of the cheaper advanced trading platforms out there. And when it comes to deposits, sums equal to or greater than $1,000 (US dollars) and cryptocurrencies encounter no fees at all. 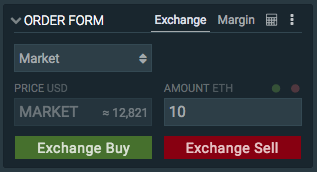 Bitfinex charges 0.1% of a bank transfer deposit in US dollars or euros. As for withdrawals, these are always charged by Bitfinex. A bank transfer/wire in euros or US dollars is charged at 0.1% of the amount being transferred, while an express bank transfer (within 24 hours) is charged at 1%. A high frequency (more than 2 in 30 days) or size (more than $1M ) fiat wire withdrawals incur a 3% fee. Once again, the fee for withdrawing cryptocurrency varies with the currency being withdrawn. However, things are made slightly simpler for users by the fact that Bitfinex charges the same for withdrawals as it does for small deposits. In other words, users would pay a flat fee of 0.0008 BTC for a “small” deposit in Bitcoin, and they would pay exactly the same amount if they wanted to withdraw the currency. And for comparison, Bitfinex’s withdrawals are generally cheaper than those of two similarly advanced exchanges, Kraken and HitBTC. Founded in 2012 and registered in the British Virgin Islands, Bitfinex has become the world’s largest cryptocurrency exchange by Bitcoin trading volume. It focuses more on professional traders than on the general public, offering users the ability to engage in margin lending, margin funding, paired trading, and limit and stop orders (as well as other kinds of order). It asks for a minimum account balance of USD 10,000, so it’s certainly not for casual users, yet its simple layout and interface makes it very straightforward to use. 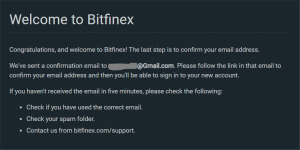 While the exchange offers users a robust variety of security measures, from two-factor authentication (2FA) to IP address monitoring, Bitfinex suffered from a couple of high-profile hacks, in May 2015 and then in August 2016. In the aftermath, the lost funds were reimbursed by the exchange, as it has learned lessons from these attacks and bolstered its security. The above steps work to reduce Bitfinex’s vulnerabilities while also ensuring that transaction and fund data is retained so that in the event of an unfortunate incident users don’t lose any of their funds. Although the exchange doesn’t insure user funds, it had taken responsibility to compensate users when assets were lost due to security breaches. For an exchange that caters almost exclusively to professional traders, Bitfinex is remarkably user-friendly. On its main dashboard everything is laid out clearly, intuitively, and logically, and it also has a mobile app (Android & iOS). 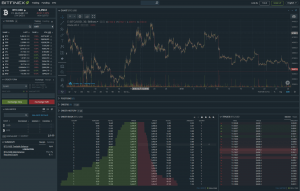 There’s a graph charting a selected currency’s value at the top, a sidebar including a tidy order form and the user’s balances, and boxes at the bottom displaying Bitfinex’s order book, incoming trades, and the user’s order history. 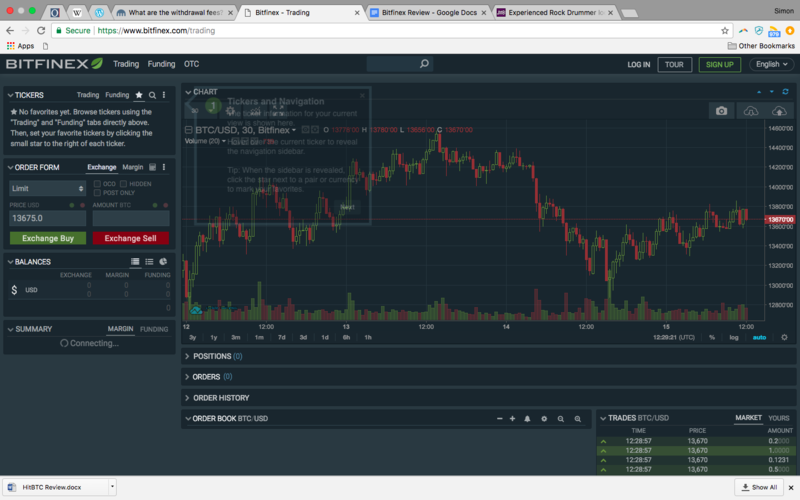 Besides, the dashboard is highly customizable and includes advanced charting tools, which also integrate TradingView charts. With regards to carrying out trades and managing funds, things are similarly uncomplicated. 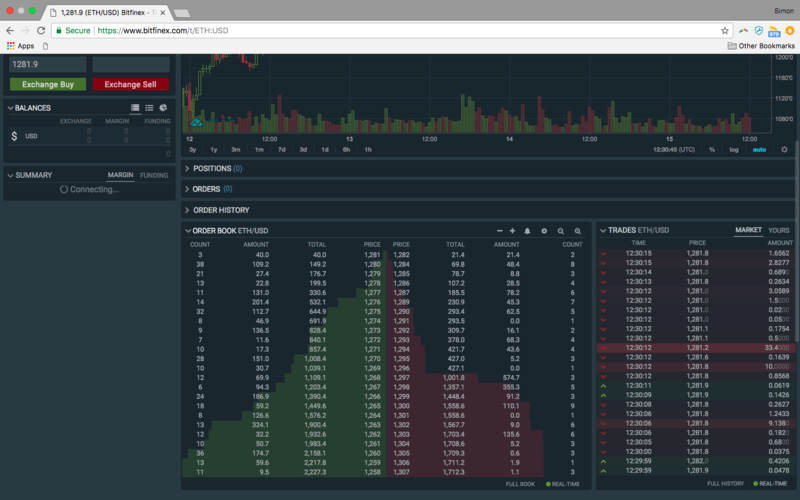 Using the order form on the right-hand sidebar, users can place everything from a simple market-price exchange to a stop-limit margin trade. And once orders have been placed and trades have been made, keeping track of your activity is easy enough thanks to the “Tickers” box on the sidebar, and the “Orders” and “Order History” boxes at the bottom of the dashboard. Getting the necessary equity worth at least USD 10,000 into your account involves a bank transfer/wire (in the case of fiat currencies) or a transfer of cryptocurrency from an external wallet. From there, users can move their funds to and from their exchange, margin and funding balances, which enable them to use the different services Bitfinex offers (e.g., margin lending/trading, over the counter trades). This process is simple enough, although in the case of bank transfers it can take some time. This is because transfers require account verification, which at the time of writing were taking Bitfinex anything from six to eight weeks to complete. As for withdrawals, these work in the same way: users either send fiat currencies back to their bank accounts via a wire, or they send their cryptocurrencies back to an external wallet. Withdrawals of fiat currencies can require as many as ten business days to complete, while withdrawals of digital currency can take up to ten hours. If you’re on your way to becoming a serious trader or already are one, Bitfinex exchange is the right place for you. 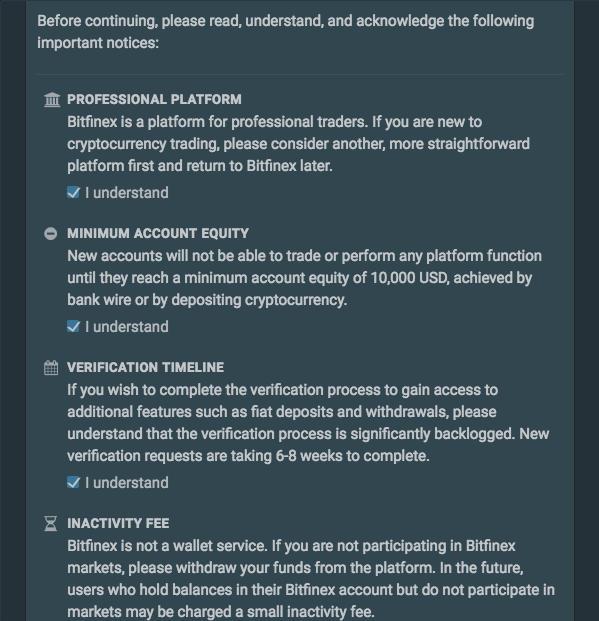 Opening a Bitfinex is as easy and straightforward as it gets, but before you create an account, be aware of the following requirements. Bitfinex is a platform tailored for professional traders. Upon opening an account, you won’t be able to perform any action until your account reaches minimum equity of $10,000 by depositing cryptocurrencies. There’s a 6 to 8 weeks KYC verification window before a user can use functions of fiat deposits and withdrawals. 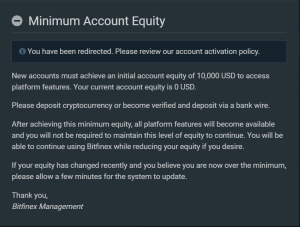 In the future, Bitfinex plans to enact an inactivity fee, discouraging users from keeping their funds on the exchange. Note that due to regulatory issues, Bitfinex restricts access for users from the following countries: the United States, Bosnia and Herzegovina, North Korea, Ethiopia, Iran, Iraq, Syria, Uganda, Vanuatu, and Yemen. To get started, go to the exchange and hit the “Open Account” button. Alternatively, you can get a feel of the platform by clicking “View Demo” and examine its interface. Once you press “Open Account,” a sign-up window pops up. 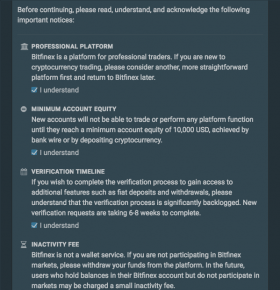 Here you have you read through and hit the checkmarks indicating that you understand and acknowledge the way Bitfinex conducts its operations. Once you mark all the checkmarks and hit proceed, you will see a sign-up table. Voila, you have created your Bitfinex account! If the registration was successful, you should see the window below, which asks you to confirm your email address. Once you confirm your email address, you’re all set to log in. When you do so for the first time, you will also have to read and agree to Bitfinex terms of service. Next, you also want to secure your account. Just go the upper right corner, an next to the bell and question mark icons you will see “Manage Account” button. If you navigate your cursor over it, you will see a menu with various account options. The second one is security. Clicking on it will lead you to the account security window, where you can set up all the desired security measures, including 2FA. Last but not least, you have to verify your account if you want to deposit or withdraw USD, Euro, or other fiat currencies. Simply go to the “Manage Account” and select “Verification” from the drop-down menu. 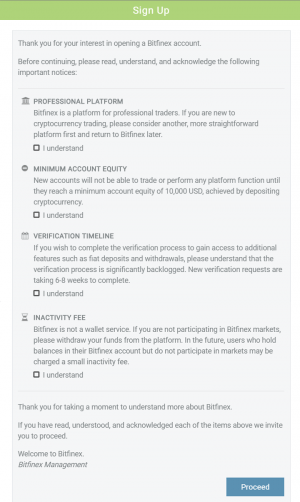 Bitfinex takes verification process seriously, so it takes from 6 to 8 weeks to verify an account. You will have to provide documents confirming your name and contact, address, identity, bank information, KYC form, and others. The same requirements apply to corporate accounts, too. To unlock full functionally of your newfound Bitfinex account, you will have to deposit at least $10 000 of capital in fiat or cryptocurrencies. To be clear, after achieving this level if equity, users are not required to maintain it at all times to keep their account functional. It’s just a one-time task. To make a deposit, head to the “Deposit” button in the upper right corner. Clicking it takes you to the deposit page where you can choose the preferred method of funding. Bitfinex supports a wide range of deposit options, including fiat currencies (USD, EUR, JPY & GBP), and a wide selection of cryptocurrencies. Once your account reaches $10 000 equity threshold, you can start making trades by hitting “Trading” button. Select the market you want to trade in, and from here you’re free to determine the price, quantity, and type of orders you would like to execute. Withdrawing your funds from Bitfinex is as simple as making a deposit. Go to the “Withdraw” window, select the asset you want to take out and fill all the required fields. Note that you won’t be able to withdraw currencies if you haven’t secured your account with 2FA and/or whitelisted addresses. Also, you must have your account verified first to withdraw fiat currencies. A cryptocurrency withdrawal takes approx. 12 hours to process. The speed of the procedure also depends on your enabled security measures. A rule of thumb here is the more secure your account, the faster Bitfinex can process your request. Regular fiat withdrawals take 5-10 business days, while express fiat withdrawal is sent out within 24 hours.